MCCC study tour outside the Wawel Royal Castle in Krakow. Learning from a guide at the Oskar Schindler Factory. 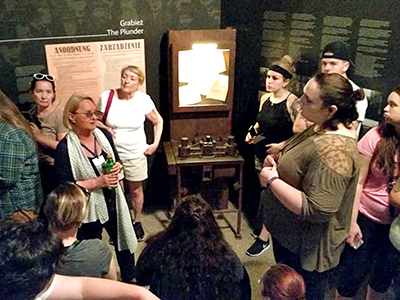 Three MCCC professors, Craig Coenen (History), Jack Tabor (English) and Laura Knight (English), led a group of 22 students, making it the second largest of MCCC’s 14 Study Tours to date. 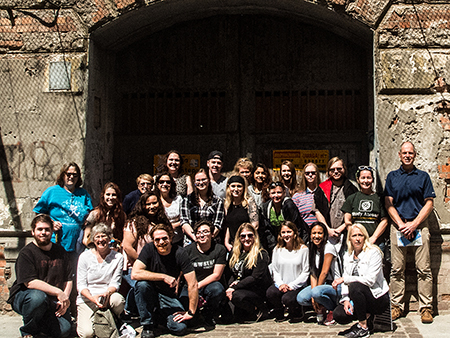 On June 8, the group gathered for a “debrief” session. For some students, the meeting with their fellow travelers was the first time they were able to voice the emotions, impressions and understandings they gained during their weeklong sojourn. Coenen noted that the trip is more of a journey than a vacation. “When people ask, ‘How was your trip?’ there are no easy answers,” he said. The trip originated in Warsaw, where students spent three days visiting the city's cultural centers and the historic places of the Warsaw Ghetto including the Umschlagplatz, Jewish Cemetery, and Nozyk synagogue. Traveling by train, they moved on to Krakow for two days, exploring the Jewish Quarter (Kazimierz) and its synagogues, the Jewish ghetto, Oskar Schindler's factory, and Plaszow forced labor camp. The trip culminated with two days in the town of Oswiecim, where the Auschwitz-Birkenau concentration camp and its sub-camps are located. In addition to learning about life in Oswiecim, students spent two challenging days at Auschwitz and the sub-camp Monowitz. Funeral Service student Angela McGraw said the trip provided a whole range of experiences and emotions. “The cultural part early in the trip was fun,” she noted. But by the time she got to Auschwitz, particularly a room where remnants of children’s clothing and toys were displayed, she struggled emotionally. Students agreed that there is an unexpected peace at the Auschwitz site. On the day they visited, it was beautiful, warm and sunny. Some considered the setting and the weather jarring, given what took place there. But Kelley Bean thought it felt right. “A place like that should be peaceful. It honors the people who died there,” she said. Daniella Lemanski added that the natural environment adds to that sense of peace. "There are birds and animals around. Flowers are in bloom. Despite everything, life continues there,” she said. Erica Sost and Liz Franz decided to go back to Poland after making the trip with Mercer in 2016. “I went back this time for closure," Sost said. "I’m not sure I got that. I’m still waiting for my ‘ah-ha’ moment,” Sost noted that her re-entry back into American life was not quite as difficult as last year, when it took her two months to share the experience with friends and family. Professor Knight, who also went on last year’s trip, recalled thinking that she would never go back. “But I felt like I needed to know more and I’m glad I went with all of you,” she told the students. 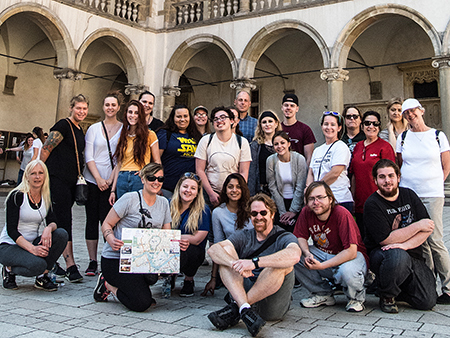 MCCC's Study Abroad program offers both semester abroad studies, arranged on an individual basis, and short-term study tours associated with MCCC courses and led by Mercer faculty members. Over the past eight years, the Study Abroad program has facilitated 113 students, 23 faculty, and 56 community members to study and travel on 23 trips to 14 countries. Tour destinations have included Italy, London, Paris, Spain, Poland, South Africa, Cuba and Costa Rica. Study Abroad is part of the Center of Global Opportunities (GO!) in the Division of Innovation, Online Education, and Student Success. According to GO! Center Coordinator Andrea Lynch, "We are looking to prepare Mercer students for global leadership by providing opportunities for them to go abroad. The experience changes their perspective and world view for the better." Learn more about past and future study abroad programs at www.mcc.edu/GO.